The scorching hot surface of Mercury seems like an unlikely place to find ice, but research over the past three decades has suggested that water is frozen on the first rock from the sun, hidden away on crater floors that are permanently shadowed from the sun’s blistering rays. Now, a new study led by Brown University researchers suggests that there could be much more ice on Mercury’s surface than previously thought. The study, published in Geophysical Research Letters, adds three new members to the list of craters near Mercury’s north pole that appear to harbor large surface ice deposits. 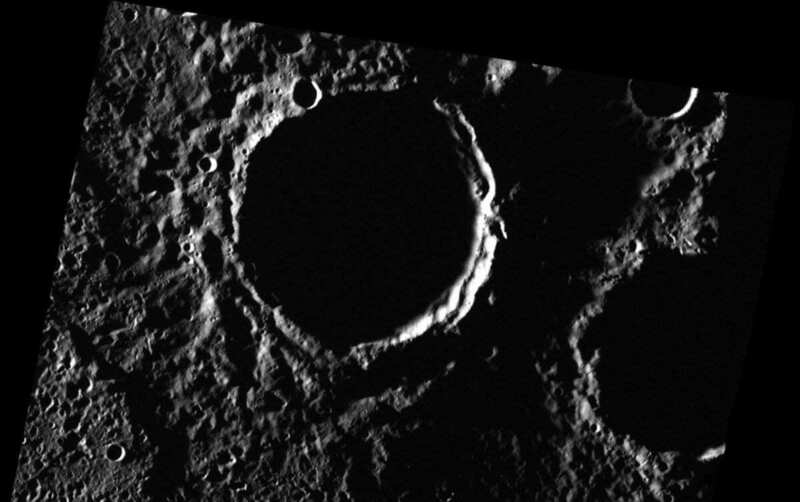 But in addition to those large deposits, the research also shows evidence that smaller-scale deposits scattered around Mercury’s north pole, both inside craters and in shadowed terrain between craters. Those deposits may be small, but they could add up to a lot more previously unaccounted-for ice. The idea that Mercury might have frozen water emerged in the 1990s, when Earth-based radar telescopes detected highly reflective regions inside several craters near Mercury’s poles. The planet’s axis doesn’t have much tilt, so its poles get little direct sunlight, and the floors of some craters get no direct sunlight at all. Without an atmosphere to hold in any heat from surrounding surfaces, temperatures in those eternal shadows have been calculated to be low enough for water ice to be stable. That raised the possibility these “radar-bright” regions could be ice. That idea got a boost after NASA’s MESSENGER probe entered Mercury’s orbit in 2011. The spacecraft detected neutron signals from the planet’s north pole that were consistent with water ice. For this new study, Deutsch worked with Gregory Neumann from NASA’s Goddard Space Flight Center to take a deep dive into the data returned from MESSENGER. They looked specifically at readings from the spacecraft’s laser altimeter. The device is mostly used to map elevation, but it can also be used to track surface reflectance. Neumann, an instrument specialist for the MESSENGER mission, helped to calibrate the altimeter’s reflectance signal, which can vary depending upon whether the measurement is taken from directly overhead or at an oblique angle (known as “off-nadir”). That calibration enabled the researchers to detect high reflectance deposits consistent with surface ice in three large craters for which only off-nadir detections were available. The addition of those craters to Mercury’s ice inventory is significant. Deutsch estimates the total area of the three sheets to be about 3,400 square kilometers–slightly larger than the state of Rhode Island. But another major aspect of the work is that the researchers also looked at reflectance data for the terrain surrounding those three large craters. That terrain isn’t as bright as the ice sheets inside the craters, but it’s significantly brighter than the average Mercury surface. Knowing that these small-scale deposits exist, and that they’re likely the source of the slightly brighter surface outside craters, could dramatically increase the ice inventory on Mercury. Similar small-scale ice deposits are thought to exist on the poles of the Moon. Research models have suggested that accounting for these small-scale deposits roughly doubles the amount of lunar real estate that could harbor ice. The same could be true on Mercury, the researchers say. Jim Head, Deutsch’s Ph.D. advisor and co-author of the research, said the work adds a new perspective on a critical question in planetary science.